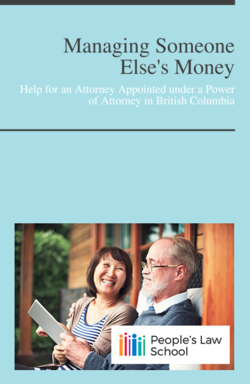 Managing Someone Else's Money from People's Law School is a guide for the attorney appointed under a power of attorney in British Columbia. It explains the attorney's duties and responsibilities, offers tips to avoid problems, and provides tools to stay organized. What is a power of attorney? · What is the attorney's authority? · Can the adult still manage her own affairs? 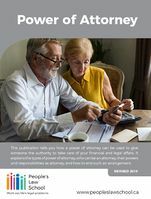 · Can a power of attorney be changed or revoked? · What if you're concerned about fraud or abuse? · When do your responsibilities as attorney end? · What if you can no longer serve as attorney? Managing Someone Else's Money © People’s Law School is, except for the images, licensed under a Creative Commons Attribution-NonCommercial-ShareAlike 2.5 Canada Licence. At People's Law School, we believe accurate, plain English information can help people take action to work out their legal problems. This resource explains in a general way the law that applies in British Columbia, Canada. It is not intended as legal advice. Legal advice applies the law to an individual's specific situation. If you want assurance that any information is appropriate to your specific situation, or recommendations on next steps with a specific legal problem, please contact a legal professional. Some sources of legal help are highlighted in the Where to Get Help section. This page was last edited on 19 October 2018, at 03:17.